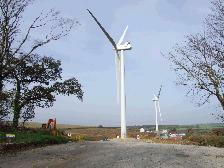 In December 2014, an application was submitted for a 225 KW turbine at Penbetha Farm, owned by local farmer Harvey John. The site is in the parish of Probus but close to the parish boundaries of Ladock and of Grampound with Creed. The application can be viewed on the Cornwall Council website. The application is no. PA14/11579. Follow the link to Council Planning Portal and then type the application number PA14/11579 into the Search box. The three local parish councils have commented on the application: Probus unanimously supported it, Ladock supported it, but Grampound objected to it. Their comments can be seen on the planning portal. The planning officer should be making his recommendation on the application in February. It may be determined under delegated powers, or it may be referred to the central planning committee. The head of planning will advise in due coures. 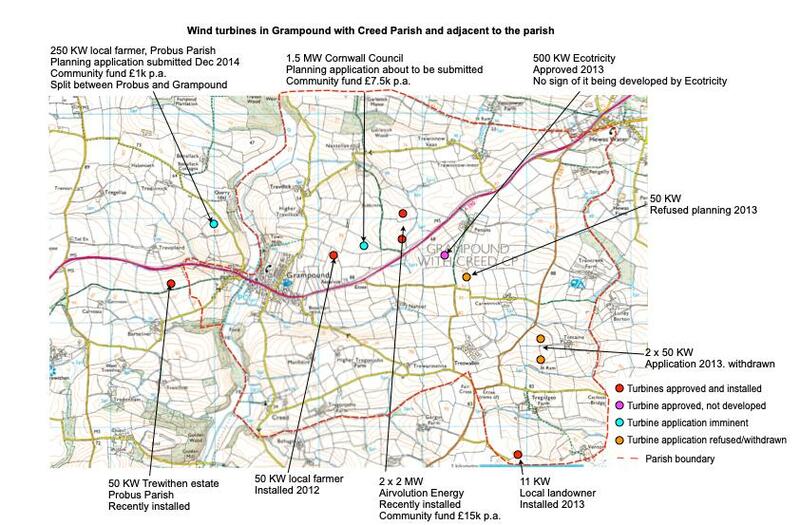 It is also expected that Cornwall Council will shortly submit an application for a turbine on Council owned land just east of the village of Grampound. This project was discussed at two public meetings in Grampound Village Hall in 2014. See previous news items January 2014 and August 2014. Further information will be posted on this website once the application is submitted.